Oceaneering AGV Systems specializes in providing mission-critical mobile robotics solutions for material handling applications involving mixed fleets deployed globally in the automotive and manufacturing sectors. 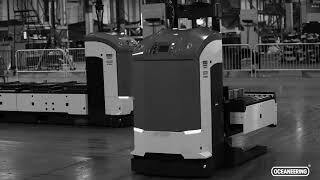 Our advanced AGV systems provide a measurable increase in productivity, enhanced flexibility, and full control of logistics. Our customized solutions support safe working environments and yield a reduction in operating costs. The Life Time Service program ensures the continuity, maintenance, and performance of our AGVs and software for the duration of their life cycle. Our service organization offers quick, professional support anywhere in the world, 24/7.